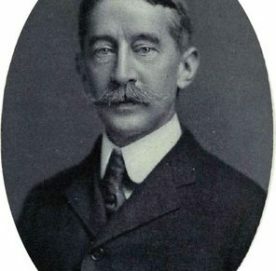 King Conn of Ireland had one noble son named Conn-eda, and he was as dear to his father as the apple of his eye, — none dearer. His mother had died while he was still a child, and after a while the King, his father, married again. He married the young daughter of his chief priest, but he did not marry her because he loved her, and that is the truth. He married her because his councilors told him that it was a wise thing for him to do, for this chief priest was very powerful. The new Queen was a cruel woman, and her hatred of Conn-eda was bitter and deep. She hated him because he was so handsome and free- hearted, and she hated him because he was so dear to his father, but most of all she hated him because every one looked to him as the one who would sometime be their king, and there was no knowing how soon that would be, for already his father was old and feeble. After a while the young Queen had a child of her own, and then she hated Conn-eda worse than ever and was always plotting how she could get rid of him, for she wanted the kingdom to come to her own son. Now there was a woman who lived down back of the castle in a poor tumble-down hut, and it was said that she knew more than a little about magic, and every one was afraid of her. Shewas the hen-wife, and had charge of all the chickens that belonged to the castle. She was a handsome woman and a strange one, and no one could tell whether she were young or old, and she might have been either. One day the Queen went by herself down to the hut to visit the hen-wife, for she wished to ask her advice. She was not ashamed to go, either, because of the woman being an enchantress. “What reward will you be wanting?” asked the Queen. Well, the Queen could not help smiling at that, for it seemed but a small reward for any one to ask, and she gladly agreed to give it. The Queen thought that was a strange thing to say, and that the hen-wife must be dreaming, but all the same she was back at the hen-wife’s door the next day, and close after her came twenty cartloads of wool and twenty cartloads of wheat, with the horses pulling and the carters cracking their whips. The hen-wife stood in the doorway with her hand on her hip and her elbow out, and the men took an armful of wool and put it in the hollow of her arm, but it fell through the hollow and in- side the house. They stuffed another armful in between her arm and body, and the same thing happened to it. Not until the house was so full of wool that it could hold no more were they able to fill the hollow of the hen-wife’s arm as she stood in the doorway. “And now for the wheat,” said the hen-wife. Then she led them to her brother’s house which was close by, and climbed up on the roof. The roof was of peat, and she bored a hole down through the peat with her distaff, so that as fast as they poured the wheat into the hole, it ran down into the house, and not until the house was so full that it could hold no more could they fill the hole, too. “Now I am satisfied,” said the hen-wife, but that was more than the Queen could say, for she was a mean woman. However, if the hen-wife could tell her how to rid herself of Prince Conn-eda, it was more to her than all the wheat and wool that ever were grown. “That also I will tell you,” replied the hen-wife. The Queen was pleased with the advice the hen-wife gave her, and she took the chessboard and the chessmen and promised to do in all things as she had been told. Then she hastened back to the castle.No sooner was she there than she sent for Conn-eda to come and have a game of chess, and he came at her command and sat down at the board with her. To this Conn-eda agreed. He had it in his head that the Queen was planning some trick against him, but he did not fear her, for he made sure he could beat her at the game.So they sat down to play, and Conn-eda was a good player, and the Queen was a poor one, but it seemed as though there were a mist before the Prince’s eyes, and when he thought he had made one play he found he had made another, and presently he saw he had lost the game, and the Queen was the winner. “This is the forfeit,” the Queen replied. The Queen was so full of triumph that she forgot the warning of the hen-wife and willingly agreed to play once more with Conn-eda. But now the magic had gone out of the board, and this time the Prince was the winner. When the Queen found she had lost, her face grew pale, and her heart sank down within her. That was a hard fate for the Queen, but after all, it would be only for a year and a day, and at the end of that time she would be free again and rid of Prince Conn-eda forever, so the bargain was not so hard as it seemed at first hearing. So the Queen went up and took her place in the high tower, and the Prince mounted his horse and rode out into the world in search of the golden apples, the grand black steed, and the magic puppy-hound Samur. But first Conn-eda went to a Wise Man he knew, who was a friend of his. Many and many a favor the Prince had done for him, and now it was time to ask one in return. The Wise Man heard Conn-eda galloping up and came out of the house to meet him, and the Prince lighted down from his horse and greeted him respectfully. “I am in great trouble,” Conn-eda began, “and I have come to you to see if you can help me. So the Prince began and told the Wise Man the whole matter from beginning to end. He told of the Queen’s hatred toward him and of the ways she had tried to injure him ; he told of how she had bidden him to play a game of chess with her, and of how he had feared her and yet made no doubt of winning the game ; and he told of how in some strange way he had become the loser, and how the Queen had claimed a forfeit from him, and what it was she had claimed. “And we played still again, and that time it was for her to pay the forfeit” ; and he told what the forfeit was that he had demanded of her. The Wise Man then took out a very beautiful and very precious jewel from a box that stood on a shelf behind the door and gave it to Conn-eda. Conn-eda took the jewel and thanked the Wise Man kindly, and then he went out to the stable and led forth the shaggy little black horse and mounted himself on him, instead of his own fine steed, and indeed the little horse was not much to look at. But no sooner was Conn-eda on his back than he found what a worth-while horse he was, for away he went lighter than a bird and swifter than the wind, and it was like no other riding that Conn-eda had ever done. rein lie loose, so that the horse was free to choose his own way, and then they came within sight of a cliff, and on the cliff sat a great gray bird. It sat so still it might have been a part of the rocks for any motion that it had, and the eyes in its head were as dull as cold, dead stones. Then Conn-eda lifted up his voice and called to the bird. Three times he called to it, but the bird never stirred even a feather, but sat there still as though it were carved from the rocks. The Prince took the jewel from his bosom where he carried it and held it up so that it sparkled in the sunlight, and again he called to the bird ; and this time it turned its head and looked at him, and its eyes grew bright as though a fire were lighted within it. Then it flew down and caught the jewel in its claw and flew back with it to the cliff. Then the Bird of Wisdom closed its beak, and the light died out of its eyes, and again it sat as still and gray as though there were no breath of life in it. Conn-eda lighted down and looked for the stone the bird had told him of, and he could not miss it for the horse’s right fore hoof was against it. He lifted it up and there he found a cup and ball. The cup he placed in the bosom of his shirt, but the ball he threw before him, according to the bird’s bidding, and on and on it rolled, up hill and down dale, over bog and through briars, with Conn-eda on the shaggy steed following hard after it. But the shaggy steed bade him take heart. “We must indeed still follow the ball,” said he, “but even so it is possible no harm may come to us. And now sit tight, my master.” With that the horse plunged into the lough, and down and down through the still cold waters. Conn-eda sat close, as the steed bade him, and presently they came through the water and out into a land of pleasant meadows and flowing streams. The lake was above them like a sky, with the sun shining down through it, and not a hair of either of them was wet, and the ball was lying there at their feet. The Prince did as he was told and put his hand into the horse’s ears, first into one and then into the other. In the one he found the wicker basket and in the other the flask of water. Then he mounted again and off he rode, and the ball that had been lying still all this time rolled be- fore them to show the way, and they followed close after it. After a bit they came to the end of the meadow and there was a great stretch of water with a causeway leading across it, and along the cause- way rolled the ball. But Conn-eda drew rein, and no wonder, for the causeway was guarded by three great fiery serpents. They lay there stretched across and across it, and the smoke rose up from their breathing in three great columns, and as the Prince looked at them, his heart melted within him like wax, for they were a fearful sight. So Conn-eda opened the lid of the basket and found the pieces of meat and took them out, and the steed set out along the causeway, straight toward where the monsters lay. 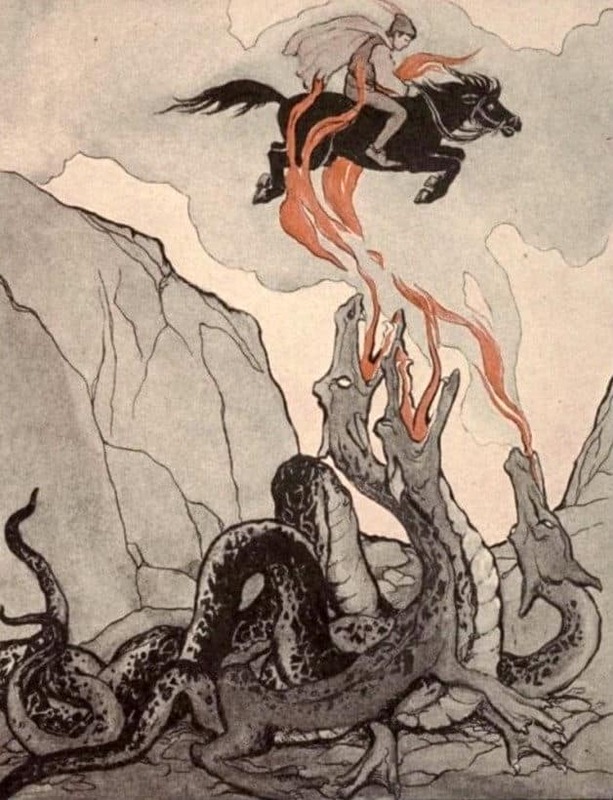 “The serpents reared up and opened their fiery jaws.” Illustration by Katharine Pyle, published in Fairy Tales from Far and Near by Katharine Pyle (1922), Little, Brown, and Company. As horse and rider came near them, the serpents reared up and opened their fiery jaws, and made at Conn-eda and his steed as though to devour them ; but the Prince was ready, and as the steed leaped over them Conn-eda threw a piece of meat into each of the flaming mouths ; not one of them did he miss. At once the serpents were satisfied, and their heads sank down, and they lay as though asleep. But the steed alighted on the causeway far beyond them, and Conn-eda’s hands held lightly to the reins. Then on they went, and on they went until they came to a flaming mountain, and the heat of it was very great. “Are you sitting firm on my back ?” asked the shaggy black horse. “ I am sitting firm,” replied the Prince. When Conn-eda heard this, fear seemed to clutch at the very heart of him, but he settled himself in the saddle, and when the horse leaped, he kept in mind what had been said to him, and looked neither to the right hand nor the left, nor up nor down, nor stirred so much as a hair- breadth in his seat. The good steed carried him over, but they were not so high above the mountain but what the flames came up and licked Conn-eda’s feet and his clothing. “Are you still alive, Conn-eda?” asked the steed, when they alighted upon the other side of it. This Conn-eda did, and at once his burns disappeared as though they had never been there, and his flesh and skin were all well and sound again. Conn-eda mounted again, and on they rode and fast they went, and then they came within sight of a castle, with shining domes and turrets, and great golden gateways. Here the shaggy steed bade the Prince again light down. “ None could have served better,” replied the Prince. Well, the steed talked on and on, and at last Conn-eda consented to do as he was asked, though it seemed to him his hand must wither in the doing. Conn-eda promised to do in all things as the steed bade him, and he then put his hand in its ear and found the dagger it had told him about. But he trembled so that he had scarce strength to even so much as point the dagger at the steed, let alone strike him. But this was all that was needed, for as soon as the dagger was turned toward him, it flew forward, carrying Conn- eda’ s hand with it, and buried itself to the hilt in the steed’s heart, so that he fell dead. Then the Prince wept bitter tears over his dead companion. After awhile he arose and took the dagger to strip off the hide as he had promised ; but there was no need of cutting, for no sooner did he catch hold of the hide than it came off like a loose glove from the hand within it, and the hide was as soft and fine as though it had been tanned by the king of tanners. Conn-eda got into the hide, and then he did not stay nor tarry but hastened away to the cas- tle, as the steed had bidden him, and in through the golden gateway. There within was a great hall with many people moving about in it, and warders at the door, but no one spoke to him nor stayed him. In the center of the hall was the leaping silver fountain of which the steed had told him, and to this the Prince hastened and he filled his cup with its water, and then back he ran the way he had come, to where the steed was lying. But swift as had been his going and coming, he was only just in time, for already the birds of prey were gathering, and he had to fight them with his sword before he could drive them away. Then he sprinkled the water from the cup upon the body of the steed, and no sooner had he done this than a strange thing happened, for at once the steed was gone, and there in its place stood a young and handsome prince, and he was so tall and so noble in his air that Conn-eda had never seen the like of him. The young man came over to Conn-eda and took him in his arms, and his face was streaming with tears, but they were tears of joy. “Conn-eda,” said he, “you have saved me from a hard and cruel fate, and little did I think I would ever come back into my own shape again and live as other men do. I am own brother to the Water King, and it was because of a cruel enchantment that I was obliged to go about in the shape of a shaggy little black horse. “ The enchantment held me fast, and only if one would ride me back to the castle and through true love would slay me and sprinkle me with water from the fountain, could the spell be broken. So Conn-eda and his companion went back to the castle, and there the joy was so great that the king gave Conn-Eda the treasures the Queen had requested. The Queen saw him coming up the road, and when she saw he brought what she sought, she threw herself from the tower in despair. Conn-eda planted the three golden apples in his garden and instantly, a great tree bearing the same fruit grew. The rest of the land was fertile and rich, with plenty of crops for all. And so Conn-eda ruled for many years with his people blessed with a rich abundance during his reign. So great a ruler was he that the province of Connacht, or Conn-eda, was named for him.